Alexander “the Tank” Armor was born in Calgary, Alberta Canada in June of 1986. He lived in Canada until he left to attend Hargrave Military Academy in Chatham, VA, USA at the age of 14. Upon his graduation from Hargrave, he joined the US army. After being medically retired he began a new chapter of his life by moving to North East Tennessee. Alex started enjoying Adaptive Sports, especially Adaptive Highland Games. 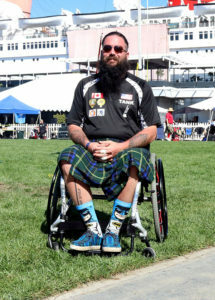 Subsequently to piping open his local Highland games, Alexander approached the Athletic Director and proposed and Adaptive Athletes Division, which the AD supported 100%. 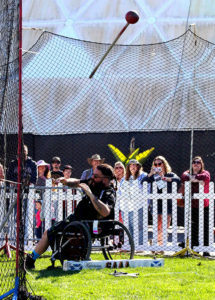 Alex’s local games became the 6th (at the time) Highland Games in the United States with an Adaptive Class. When the next local games were held, with their new Adaptive Class, Alex finished the day as the Division Champion and a new Passion blossomed in his life. Now not only is Alexander a powerful Adaptive Athlete, he is a tenacious advocate for Adaptive Sports. He is living by the motto of “You’re only as disabled as you SAY you are! You can do anything you decide you’re going to, you just have to do it differently!”. Alex has competed, and is currently scheduled to compete in games from Michigan to Florida, Idaho to Georgia, California to Virginia, as well as many other states and countries. This year will mark Alex’s Third Year devoted to Adaptive Highland Games, Adaptive Strongman and World’s Strongest Disabled Man. He is a passionate Adaptive Athlete in several other sports, such as: Precision Marksmanship, Handcycle, Archery, and Boxing. Alex is a consummate sportsman, and he still makes time for Fishing, Hunting, and various shooting sports and primitive hunting techniques. He still has family living in the Calgary area and his father lives in Tennessee as well. For more information, and great videos please see Alex’s athlete page on Facebook.